Update: We received an official comment from Adobe and have updated the article to include it below. Adobe is the latest in an increasingly long line of businesses that have announced they'll be raising prices for their UK customers in response to the pound’s fluctuating value against the dollar. 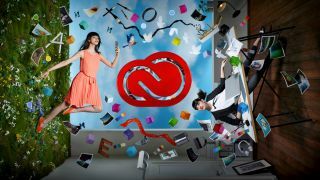 The company behind popular, and for some essential, products such as Photoshop, Lightroom, InDesign, and Illustrator sent its customers an email stating that because of “recent changes in exchange rates” Creative Cloud subscriptions would be rising in price from March 6. Adobe’s official blog post on the subject is fairly scant when it comes to exactly how much the prices are rising, stating that Swedish and Brazilian customers will also see a rise and that “existing customers will receive information about their subscription pricing directly from Adobe”. "Like many companies doing business globally, Adobe is making pricing adjustments based on fluctuating foreign exchange rates. Markets impacted include Sweden and the UK where pricing varied slightly based on the specific Adobe offering. "Select customers saw the same price adjustments but adjustments may have appeared to be larger if they were coming to the end of a specific promotion. "For example, a customer who was part of a promotion that discounted the product by 50% for the first year would receive an email communication indicating that the promotional pricing period was ending and they were shifting to standard pricing while also noting the fluctuation on the foreign exchange rate. Regardless of exactly how much costs are set to rise by, Adobe’s creative software isn't exactly cheap to start with. For those who rely on its products for their studies or freelance work, any increase could hit hard. Outside of professional spheres, the most widely used piece of software that’ll be subject to a price rise is probably Photoshop, so in light of that we’re flagging up some free alternatives. They may not have all the features that make Photoshop the first choice for professionals, but for most people they’re worthy alternatives. Our first suggestion is GIMP, which is by far the best free Photoshop alternative. It has fully customizable masks, layers, advanced filters, color adjustments and transformations, as well as a wealth of user-created plugins and scripts which replicate popular Photoshop tools. Even better, it comes with an excellent in-depth user manual to help you get started without a fuss. Photo Pos Pro is another excellent alternative. It has interfaces to accommodate both beginners and advanced users, the latter of which closely resembles Photoshop. If you find GIMP’s endless lists and menus intimidating and/or exhausting, then Photo Pos Pro could be the option for you. Its main drawback is the limit on save file sizes (1024 x 2014 pixels), but if you decide you like the basic version and want to upgrade, Photo Pos Pro Premium is currently discounted to £17.67, which is a reasonable price for a stellar Photoshop alternative. There are several other free alternatives which may appeal to you, the rest of which you can find here.